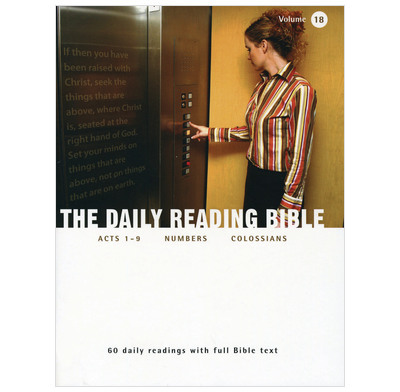 60 short daily Bible readings on Acts 1-9, Numbers and Colossians. The Daily Reading Bible is an all-in-one resource and a good way to get started or keep going in your daily reading of the Bible. It's all here in one booklet that you can take with you anywhere - on the train, on the bus, to the park at lunchtime, or to your favourite armchair. I ordered this resource for a friend who became a Christian last year but has struggled to get into daily Bible reading. These notes are ideal, given they are not dated, because you can read them at your own pace. My friend is a carer and is thus under time pressure. Having the Bible passage printed in the notes means she can easily pick it up when she has small windows of opportunity. I felt totally at peace in giving them to my friend, knowing they contain sound and solid Christian teaching. A real gift. I am enjoying using these notes, after many years of using Scripture Union material and Bible speaks today commentaries. It is useful to have the text for when you are out of your home with the notes, and I find the questions stimulating and helpful. It is useful to have the spaces to write in the answer, as this helps to keep you disciplined in your Bible study! This is a very good book that enhances personal devotional time. The questions are often thought-provoking but never too challenging - there is always food for thought. Personally, I read this with a commentary to help develop my understanding of things when answering the questions; sometimes I need that extra something to guide me in a different direction. What limits my rating on the book, is the small space given to answer the questions and the Bible reading could be shorter to enable the reader to focus on the specific theme/text the questions ask about. I think a small reflection on the Bible reading would be a useful addition, but as an overall comment - very good, practical and helpful. This is a really handy Bible reading guide. It makes you read, think and pray, even if you don't have long to do it. This has helped me to stick to regular Bible reading. As someone who loves the Lord and wants to read the Bible studying it and doing a regular quiet time is something i find difficult! These studies are really great because they have all you need....the Bible verses, extra verses as footnotes or appendices, space to write notes and some questions to get you thinking. I also like the box at the beginning where you can write peoples names tjat you want to oary for and at the end of the days study there is a point to ponder and a prayer suggestion. It is still something I struggle with but these studies have really helped me and continue to do so. I read mine during the quiet ten minutes I get in the early morning while breastfeeding; all the text on one page is perfect and often that early in the morning it's helpful to have pointers for prayer and reflection later in the day. I have struggled to find a solid bible based daily bible study resource, a while ago I picked up a couple of Daily Bible Reading Booklets at a conference and found them useful. Each study can take around 20 minutes, the passage is on the page (enabling you to use them easily at work or on the train) with a couple of solid questions - this isn't David and the 'what do the stones mean to you' stuff, these are appliable questions. Having had a real guilt problem over my inability to read the bible every day, this 'no date' format has helped greatly. Also being a very portable book means I really can use this wherever and whenever. The bible has come alive for me again, and I really look forward to my quiet times when I can study Gods' Word. Having the Bible passage and some structured questions to make you think about it all in the same place is an excellent way to make time for God in a busy life. I find them great for reading on the tube and they're light to carry in your handbag. I actually purchased these notes for two young Christians in their mid-to-late teens. I'm trying to encourage them to read the Bible and thought this was an accessible resource for them. I like the fact that there are large sections of Scripture covered, so that people can get a sense of the narrative of Scripture. I like the simple, thought provoking questions, to help people engage with the text and think about what God has said, and is saying through the Scripture. I like the fact that it is anchored in our relationship with God, with an opening prayer, to fix our thoughts on the Lord, who spoke it, and who helps us to understand and apply it to our lives. I also like the fact that it is undated, so that there is less guilt attached to "missing a day, or two". I think that is helpful for young believers who are just getting to grips with reading and "studying" the Bible for themselves. The feedback I've had from them has been good. One of them was pleased, that the Bible passages were printed in full, in a light document, which she could carry to college with her. She could anticipate doing these studies during her free periods at college. Twenty minutes did not appear too daunting! I think it is a gentle, but not trivial, introduction to Bible reading and study. I hope it will encourage my young friends to think Biblically, to develop a Biblical worldview, where they filter the influence of the culture, through the mind of Christ. There is only so far another Christian can take you. You need to learn to walk with God, for yourself.